I may have mentioned that Matt and I went to the UK last summer and ate a lot of pork belly. It was consistently one of the best dishes we had all over several parts of England and Wales. If there’s one thing the British know, it’s how to make excellent crackling (that sound you hear is Matt furiously listing all the other things British people are excellent at. (So far; crackling, funny shows, more funny shows, chicken keeping). I’m sure there’s more but we’ll leave it at that for now. This was pretty much a nightly conversation on our trip. Emily: “We have to make this when we get back” (distractedly tries to figure out recipe). Matt: “Stop looking at me like I stole all the crackling!” (whilst licking crackling-glazed fingers). Well, we’ve been back for six months and our local shop now has lovely local pork belly and we thought we’d finally try to make it in our local stove. In England, it was often paired with bubble and squeak, and a hard cider sauce but I really wanted to try a soy and honey glaze combined with the crisp crackling we found on our trip. 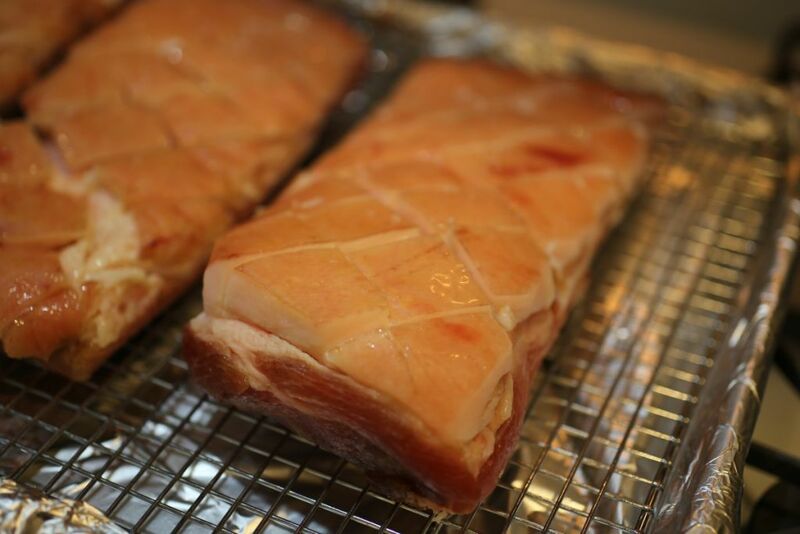 If you can get (good quality, ethically raised) pork belly with the skin still on – you’ll need the skin to get truly crispy pork belly – it’s definitely worth seeking out. It’s a very affordable cut and it’s also very rich, so you’ll want small portions. That being said, I wouldn’t bother cooking a piece smaller than about 2 pounds because it will shrink a lot in the oven and could dry out. There’s also so much you can do with the leftovers. It’s absolutely lovely paired with a fried egg and this Pickled Cucumber and Avocado Salad (really any crisp, vinegary greens would be great). I also really love it with Sesame Roasted Pears and a tart kale salad. But my all time favorite use of pork belly is Bánh mì sliders. So, so good. Make sure the skin is very dry. Scoring helps it get crispy. Tent tightly with foil for the initial 90 minute cook. First, score the skin on top in a crosshatch pattern, about a half inch apart. Try not to cut into the meat itself. Combine the salt and sugar and rub it all over the pork, including in the cuts. Wrap the pork tightly in plastic wrap, and refrigerate overnight (or for at least 4 hours, overnight is best). Unwrap, rinse, and pat dry. Place the pork on a rack in a baking sheet lined with foil (or a roasting pan), Brush the vinegar over the skin of the pork and let sit uncovered in fridge for a couple of hours (or up to a day) to cure. When you’re ready to cook, preheat your oven to 350 degrees F. Lightly brush a very thin layer of oil over the skin (this helps it get extra-crispy). Cover the tray tightly in foil and roast for 1 hour and 30 minutes. While the pork roasts, combine your sauce ingredients in a small pot over medium heat. Bring to a simmer, and cook until slightly thickened, about 6-8 minutes. 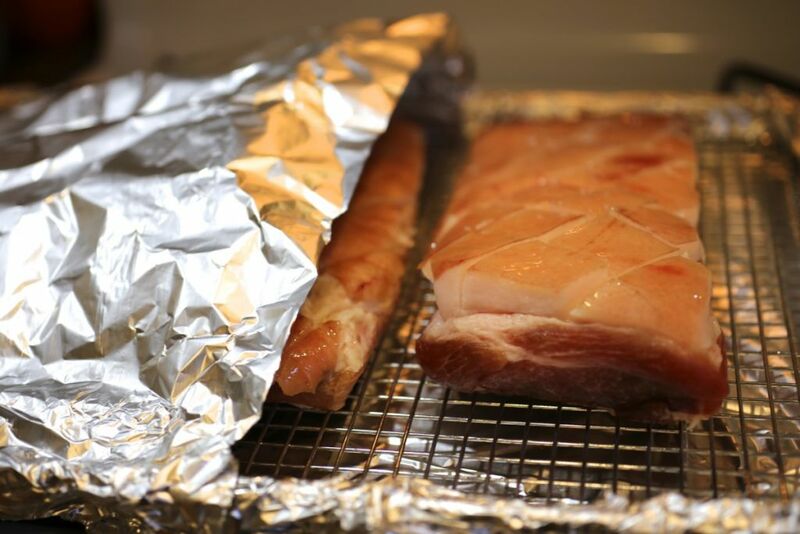 After the pork has roasted for 1 hour and 30 minutes, remove it from the oven and raise the temperature to 450 degrees F. Remove the foil and brush both sides of the pork with the sauce. Put it back in the oven, skin side up, uncovered, for 10 minutes. Remove the pork again, flip it, brush with the sauce, and roast for another 10 minutes. Finally, flip the pork again, brush it with the sauce again (make sure to reserve a bit to serve the pork with later), and roast for 15 minutes, until the top is crispy. Be careful it doesn’t burn during this stage. 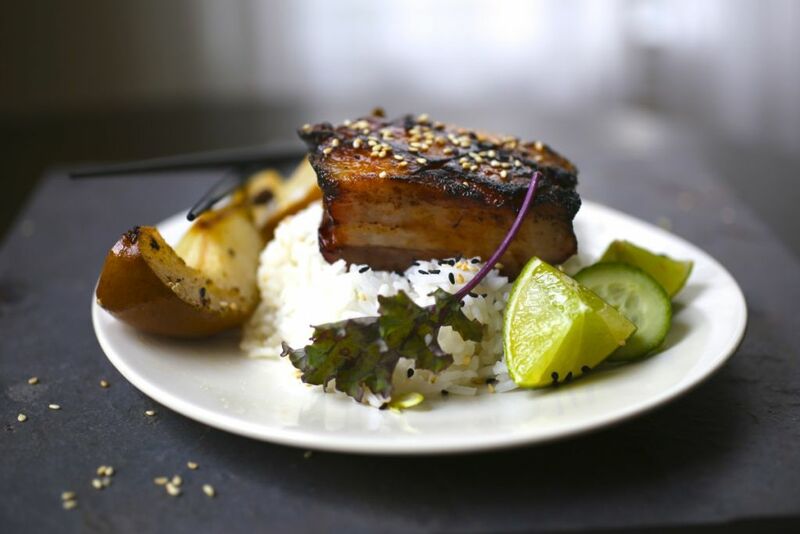 Sprinkle your crispy pork belly with sesame seeds and scallions. Serve with rice, Sesame Roasted Pears, and the reserved sauce on the side. *Full disclosure: I completely burned the holy bejeezus out of mine because I was distracted and wandered away for too long while I was glazing it. Remember the end of Time Bandits? Yeah, I thought it was going to go straight into the garbage, but I cut the burned top off and re-crisped it in a pan. IT WAS SO GOOD. Even the burned crackling was delicious (though scary-looking). This recipe looks so good. Love the disclosure too. I would probably be snacking on the burned bits of pork as well. Thanks! The burned bits were ugly as sin but the most delicious thing you could imagine. Happy accidents, I guess. I tried pork belly the first time I was in England. My hubs is a Brit and will definitely love this. My name is Nick and I’m writing on behalf of the National Pork Board. 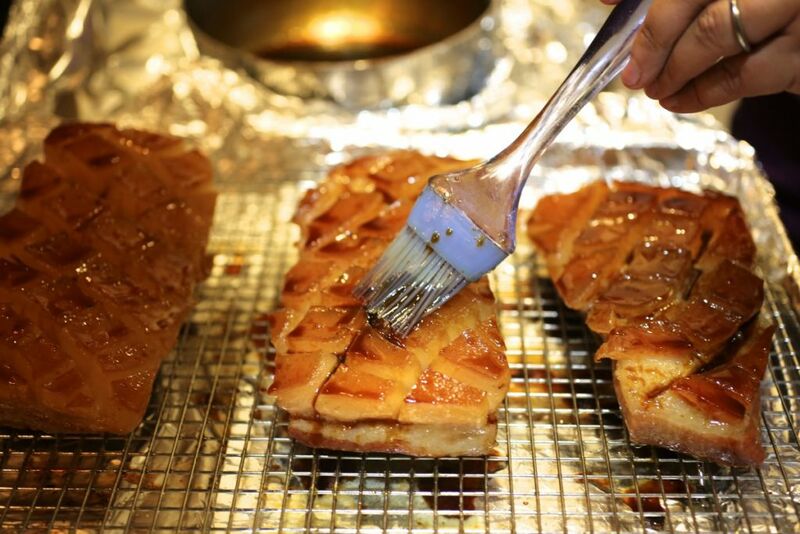 We’d love to post a link to your Crispy Pork Belly with Soy Honey Glaze recipe on our social media pages. We’ll use your image and link to your blog post on both Facebook and Twitter (we’ll pin the image on Pinterest), but we would like your permission to use your beautiful photography. As long as we’re credited and there’s a link to the blog, we’d be happy for you to use the image. Thanks for choosing us! I’m curious if your photo(s) show three 2-lb pieces of pork belly or did you buy one large piece and cut into multiple pieces (and if so, what size)? I ask because you made note of not going smaller than 2-lbs so it doesn’t dry out so I was wondering what we were looking at. I think our piece was probably about 5-6 pounds (we were having a party) but it had been cut into 3 sections at the store. If it had come as one piece I probably would have left it that way but even cut up, it cooked up perfectly fine. It does cook down a lot so it your piece is really small, it might get a little tough. The truth is pork belly is pretty hard to mess up! I was looking for a glaze recipe to use with the trader joes precooked pork belly and this was fantastic. I added a touch of brown sugar to the recipe since there was none on the pork belly. I cut the pork belly into slices and poured the glaze over it. Initially I contemplated brushing each slice and continuing to fry it but there was already so much grease in the pan and I didn’t feel like draining and continuing but next time I think after browning it I will transfer to a cookie sheet and let it roast in the oven for a few more minutes with the glaze. I let the glaze reduce till it was a thick syrup. Scallions and sesame seeds hit the spot. Yes, just rinse it under cold running water and dry it well. Hope you enjoy it! Wow, sounds good! I agree that a quick roast in the oven would be a good idea. Hi, you say some nice things about our English pork! Belly is one of my favourite cuts, it’s cheap too but can tend to be fatty. I tend to buy a large piece of which I’ll make bacon with about 1/3rd, use another 1/3rd for making sausages (usually add a bit of shoulder too), then the rest we usually roast over sauerkraut. Not very English, but very tasty. Get a roasting pan, add a jar of sauerkraut, add about half a pint of lager together with some sage, mustard, grated apple, garlic and juniper berries. Then the pork, skin side up (and the skin very dry, as you say in your article, to get good crackling). Then roast in a low oven for an age. It’s fantastic. Recipe’s from “preserved” (http://www.amazon.com/Preserved-Nick-Sandler/dp/1906868026), one of my favourite recipe books ever.